New photographs of the world's longest aircraft have been released, before it is unveiled for the first time. The Airlander 10 is 302ft (92m) long, which is about 60ft (18m) longer than the biggest airliners. A British firm has spent the past nine years developing the prototype in the UK's biggest aircraft hangar, at Cardington in Bedfordshire. It will be floated inside the hangar for the first time since its completion on Monday. 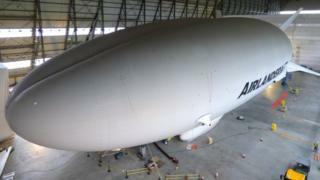 The airship, which cost £25m to build, can stay in the same spot for three weeks and can even fly with bullet holes in it. The US Army ran out of money to develop it as a surveillance machine, so the British aerospace company behind it bought the rights back. Hybrid Air Vehicles (HAV) believes the vessel, which is quieter and emits less pollution than traditional aircraft, could be the future for air travel. The aircraft needs 1.3m cubic feet of helium - enough to fill 15 Olympic-sized swimming pools - to get off the ground. It can take off vertically and land on almost any surface, including ice, desert and water. The firm is hoping to build 12 Airlanders a year by 2018, some as passenger aircraft that will carry up to 48 people at a time. Chris Daniels, Head of Partnerships at HAV, said: "We will not compete with a 747 flying across the Atlantic, but we can offer the ultimate flight experience for tourism and leisure purposes. "It's perfect for sightseeing because we can have floor to ceiling clear panels, and we can open the windows because we are not flying as high or as fast as traditional planes, but we will not be offering a service to get from A to B as quickly as possible." Other plans include providing coastguard duties, military and civil surveillance, filming and academic research. Companies that deliver heavy equipment to remote corners of the world might also find the aircraft useful, Mr Daniels said, or they might be used in humanitarian missions. The firm hopes to take the Airlander 10 on its first flight outside of the hangar in the next few months. Tim Robinson, editor-in-chief of Aerospace, highlighted concerns over the price of "scarce helium" and the impact of the weather on its ability to fly. However, he said the invention could be the new smart phone, because customers might not realise how much they need one until it is here. "A comeback by airships has been predicted before and it didn't happen. So there is an element of 'here we go again' but this is a next generation model using new materials and new technologies," said Mr Robinson. "If you need to transport goods then it's cheaper than aircraft and faster than shipping, so there could be a market there, and the humanitarian possibilities are also really exciting. "I wouldn't be surprised if the UN eventually ends up buying some, but everyone is waiting for the company to prove itself in demonstrations first," he added.